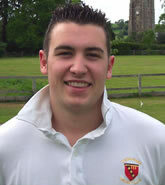 Ben showed good promise as a hard hitting middle order batsman and bowler of some pace. Accuracy was a bit off, but pace he certainly has. Originally from Winford, and now an occasional player as he has taken over a local hostelry.